Which RV Rubber Roof Product should I Use To Re-Coat My RV's Roof? Have a rubber roof . Want to re-coat. What should I use Dicor or Liquid Roof? Nothing like a brief to the point question and my answer is going to be pretty brief and to the point. Either of the products you mentioned Dicor or Liquid Roof will do the job. 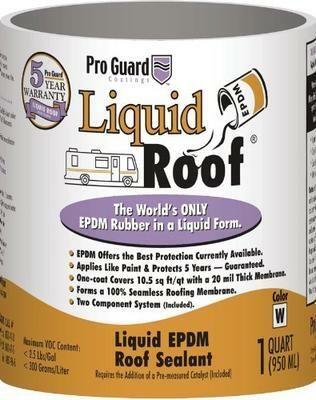 I have no favorite product, maybe some of our visitor's will chime in on their favorite RV Rubber Roofing Product. The key to tackling this job is making sure that you follow the manufacturer's instructions for applying their product. If either of the two Rubber Roof Coatings are not applied properly they will not do an effective job of preventing leaks in your RV's roof. The videos below should help you with your RV Roof Re-coating project. It even includes information for RVer's that have a TPO (Thermoplastic Polyolefin) Roofing System on their RV.